Even though I panic through the last half of August about summer ending too quickly, something happens to me in September. The days are still gloriously warm and sunny, but the cool mornings and the color in the trees tell a different story, and suddenly I'm ready for cozy socks and a slow simmering stew. Don't tell Summer, but Fall is my very favorite season. Did you hear? Spoonflower is now offering custom wallpaper and wall decals. Holy decorating opportunity, Batman! Awesome vintage salt and pepper shaker DIY. This is so cool...and a little bit eerie: 32 metronomes that all sync up. Have a cozy weekend, my friends. 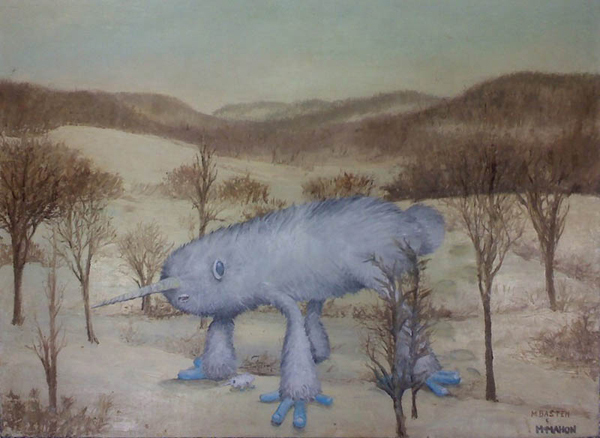 You know those hideous landscape paintings you always see in places like St. Vincent de Paul? 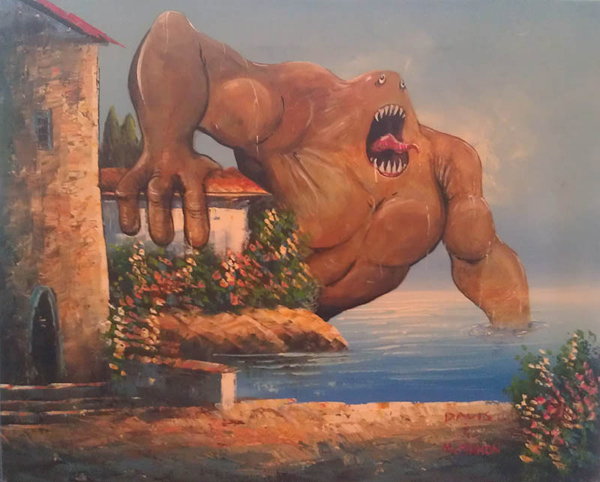 Well, artist Chris McMahon took those eyesores and added monsters- and now they're the coolest things ever. See more here, on Twisted Sifter. Let me just begin this post by saying I'm sorry. And you're welcome. I apologize in advance for the amount of broccoli you'll have to eat to counterbalance these bad boys; and yet, I suspect even as you reach for your third helping, you'll be praising my name for bringing your attention to the most crispy-creamy-tender-chewy-glazey-golden-confection you'll ever make. 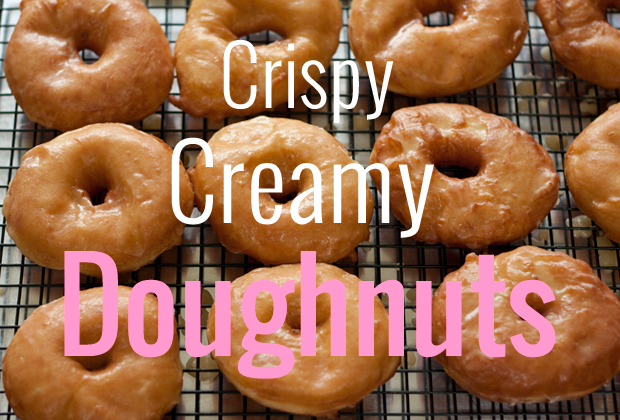 While store-bought is ordinarily kind of a dirty word in my mind, there are a select few things that I strive to make homemade versions of that are as delectable as their commercial counterparts; the list includes: Oreos, and a perfect, glazed, yeast doughnut. I crossed the first one off the list with Deb's absurdly delicious recipe (actually, she overshot the mark a little and made them out-of-this-world-better-than-store-bought), and now, finally, I can put a giant, proverbial check mark next to these holey wonders. They're tender, chewy, pillowy, and airy, with enough crispiness on the edges to keep your teeth entertained. The glaze adds just the right amount of sugary sweetness, and shatters delightfully as you bite down; in other words: eat your heart out Krispy Kreme. Makes about 14 large doughnuts and doughnut holes. Sprinkle the yeast over the warm water, and let stand for at least 5 minutes, until foamy (this is called "proofing" your yeast). If mixture doesn't foam, toss it and start over with new yeast. In a large bowl, mix together the proofed yeast, milk, sugar, salt, eggs, shortening, and 2 cups of flour. I opted to do this in my KitchenAid stand mixer, but you can also do it by hand. Beat in the remaining flour 1/2 cup at a time, until dough is no longer super sticky. You may be tempted to use more than 5 cups of flour, but I strongly recommend that you don't- more flour will result in a denser, breadier texture. Knead for a few minutes (by hand or with dough hook) until the dough is smooth and elastic. Place the dough in a very large, greased bowl, cover, and set in a warm place to rise. Let dough rise until doubled (generally about an hour, but keep an eye on it). You can tell the dough is ready if you poke it and the indentation remains. Turn the dough onto a well-floured surface, and gently roll out to approximately 1/2 inch thickness. Cut with a floured doughnut cutter (I have this one. You could also use this one if you want smaller, more Krispy Kreme sized doughnuts). 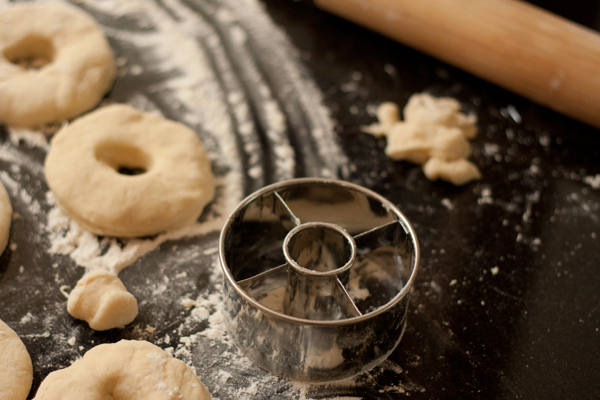 As you're cutting, make sure you press straight down with your doughnut cutter, and don't twist it from side to side. 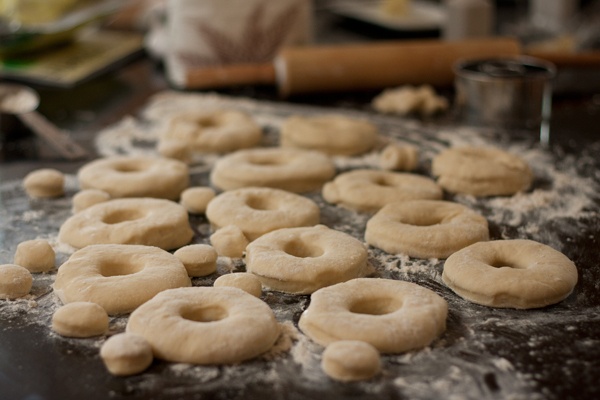 Twisting can seal the edges of your doughnut, and prevent it from rising fully (this is true for biscuits as well). Remove the doughnut holes, and space them out so you have a few inches between all the doughnuts and holes (I put mine too close together, and had to cut them apart. They puff up like crazy!). Cover loosely with a cloth, and let them sit out on a floured surface to rise until doubled. Meanwhile, in a saucepan over medium heat, melt the butter, and stir in the powdered sugar and vanilla until smooth. Remove from heat and stir in hot water one tablespoon at a time, until icing is thin enough for dipping, but not watery. Set aside. Pour oil into a dutch oven or large pot (I used my cast iron dutch oven and it worked like magic), and attach a deep fry thermometer to the side. Heat oil to 325° (it's not an exact science, but try to keep it as close to 325° as you can. I found 350° browned them a little too quickly, but if the temp is too low, the doughnuts will absorb the oil and feel greasy). Prepare some cooling racks (I recommend lining a cookie sheet with paper towels and placing it under the racks to catch drips), and get ready to rock. 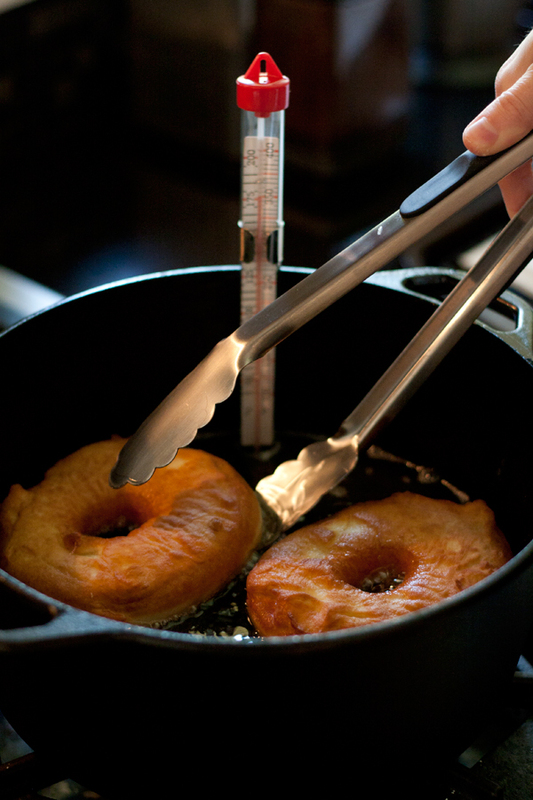 Very gently pick up a doughnut with a wide spatula, and slide it into the hot oil. They may deflate a little as you slide the spatula under them, but don't worry, they puff up again beautifully once they're in the oil. I was able to cook two at a time in my 5-quart dutch oven. The doughnuts will cook very quickly- less than a minute per side...or until they are as golden as you like them. Turn them over as they rise to the surface (these OXO tongs are invaluable for this part) and fry the other side until golden. Remove from oil and set on wire rack to drain. If your glaze has developed a sugar crust by this time, just heat and stir for another moment to re-liquefy it. 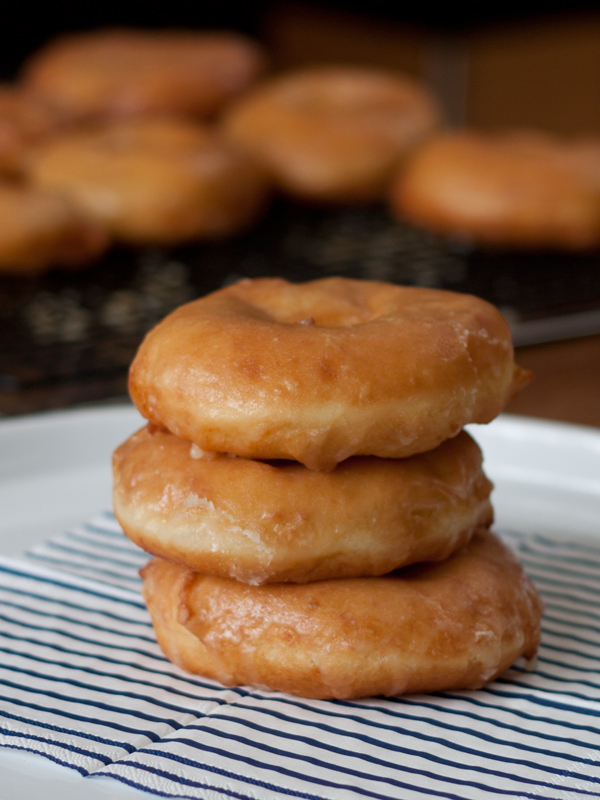 Dip doughnuts into the glaze while still hot, and place them back on the wire racks. 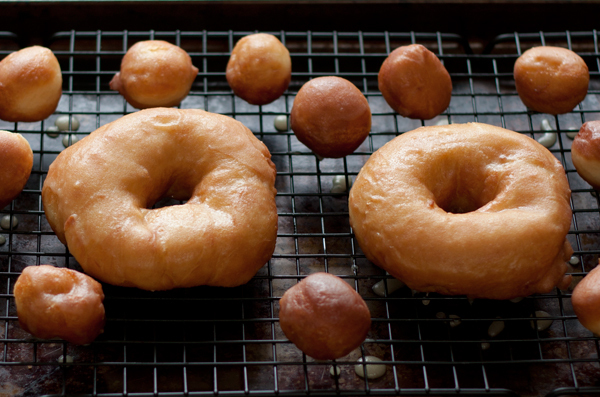 Repeat this process until all your doughnuts and doughnut holes are fried and glazed, and you are in olfactory heaven. P.S. For the record, I actually love broccoli. In case of emergency, push here. I love Jennifer's Thrown Together posts. Brooklyn Tweed's new Fall patterns. Yumm...especially this striped number. This raincloud cushion is so sweet. You could make your own with this fabric from Spoonflower. P.S. This picture is one of my all-time favorites. 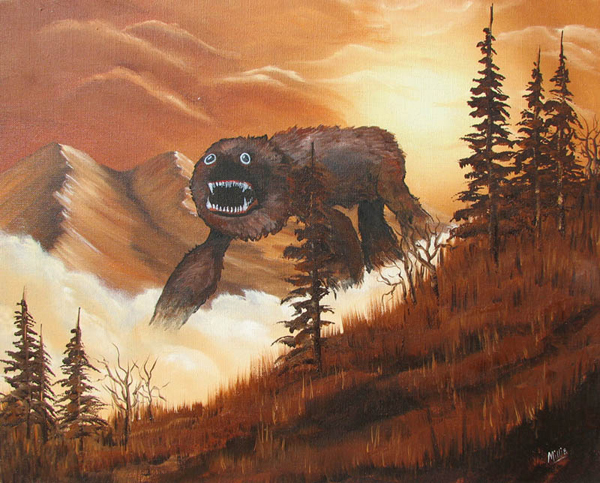 Someday, I want a giant print of it hanging in my music room. 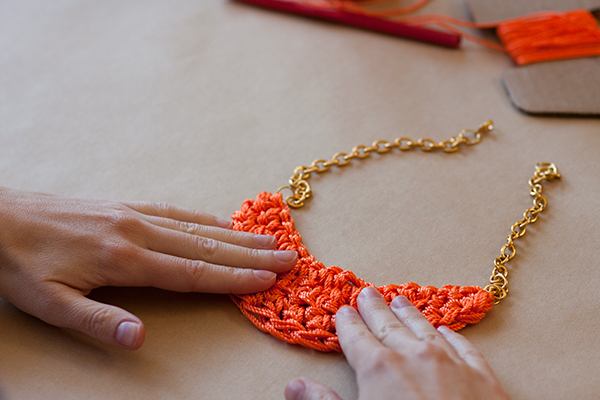 I was super inspired by this gorgeous J.Crew Hyacinth necklace, but I wasn't so thrilled about the $150 price tag, so I decided to make my own version! 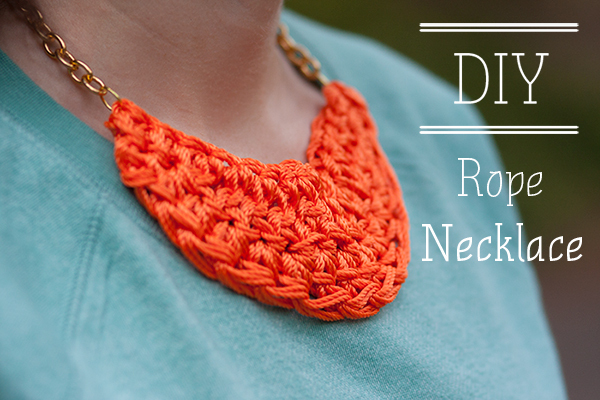 All that's required is some basic knowledge of crochet (really basic, I promise), and a few materials, and you can make one too. If you don't want to make one yourself, these will also be available in my shop very soon. - 1 cone of #18 Nylon Mason Line (you should be able to find it in any hardware store, including right here at Home Depot). 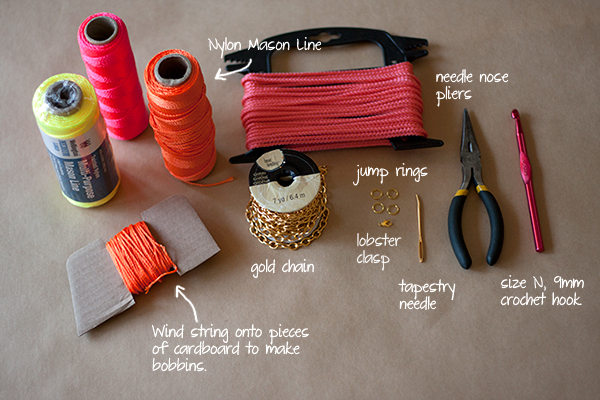 You can also use any string/twine/rope of your choosing (I made a few necklaces with this stuff, which is much heavier weight than the mason line). 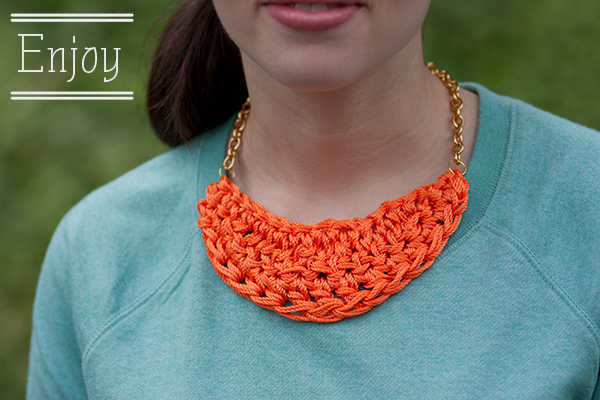 Just remember: the thicker your cord, the larger your necklace will be, so adjust the number of stitches if necessary. 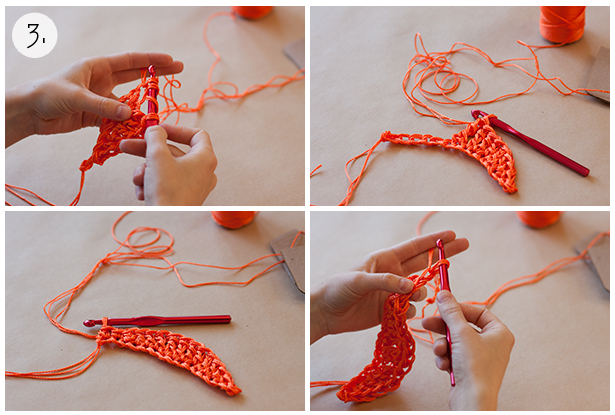 This pattern uses several very basic crochet stitches: a single crochet, a half double, a double, and a triple. They're not scary, and if you can do one, you can do them all (the only real difference is the number of times you wrap the yarn over and pull up loops. The technique is the same for all of them). There are tons of great illustrated and video tutorials around the web, but here's a place to start. Prepare your materials: we're going to use three strands of mason line held together, so you'll need to be able to pull from three separate sources. The easiest way I found was to wind some onto pieces of cardboard to make little bobbins, but you can also just wind it around your fingers and make a small ball. Holding all three strands of mason line together, make a slipknot, leaving several inches of tail to weave in later. Chain 16. Triple crochet in the next 3 stitches. Now you're just going to mirror what you did in step 2: double crochet in the next 4 stitches, then single crochet in the last 2. At this point, your necklace should look like the picture above, in the lower left corner. 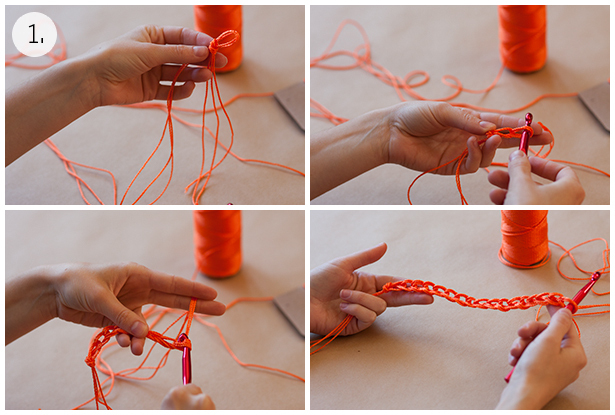 Chain 1 stitch and turn. 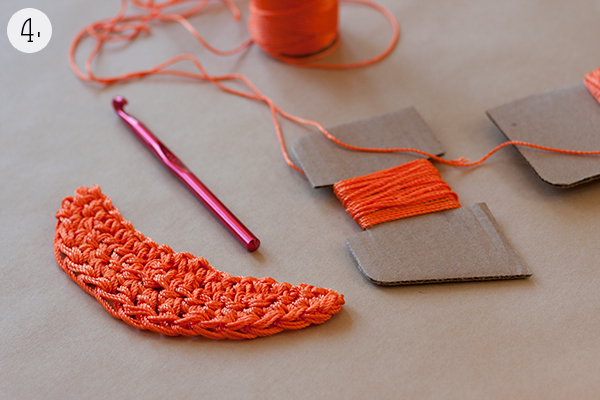 Your last row will be exactly like your first, but instead of using double and triple crochets, you'll use half double and double. So: single crochet in the first 2 stitches, half double in the next 4. 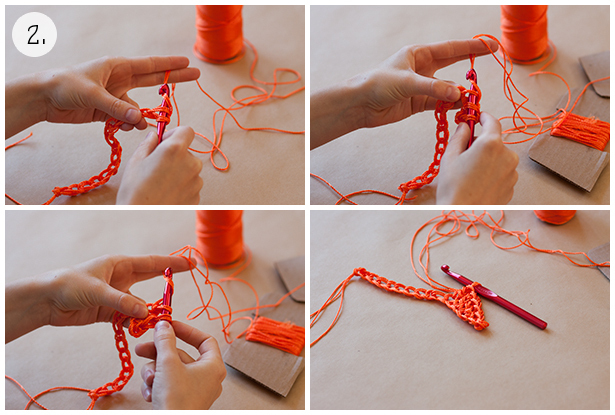 Now you'll double crochet the middle 3 stitches, half double in the next 4, and single in the last 2 stitches. Detach two 6-inch pieces of chain from your spool or strand. 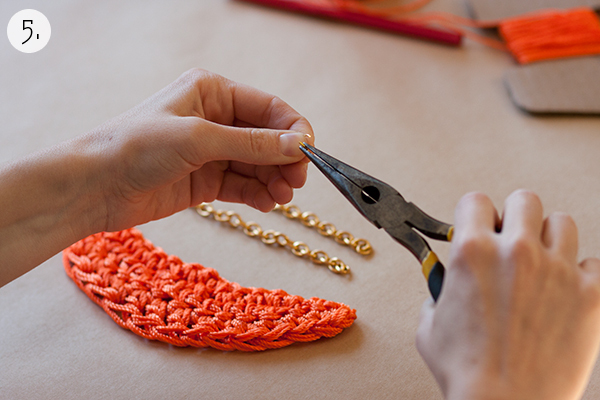 Open two of the jump rings with pliers and slip one into each end of your crocheted crescent. Slip chain onto jump ring, then close ring with pliers. Repeat on other side. 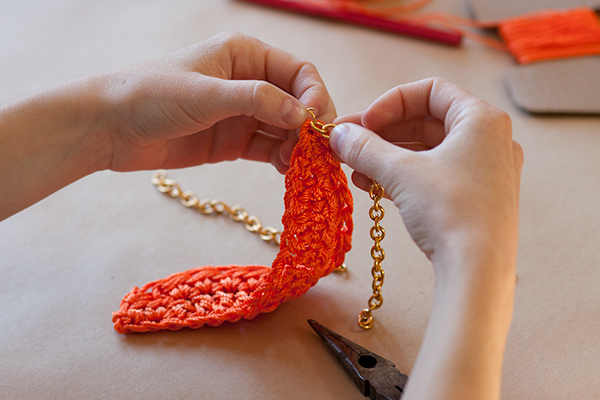 Attach the other two jump rings to the ends of the chain, slipping your lobster clasp onto one of the jump rings. Close with pliers. The crescent will be quite malleable, so you can manipulate it into more of a u-shape if you'd like. Note: this pattern is for personal use only. Please don't sell the finished product. 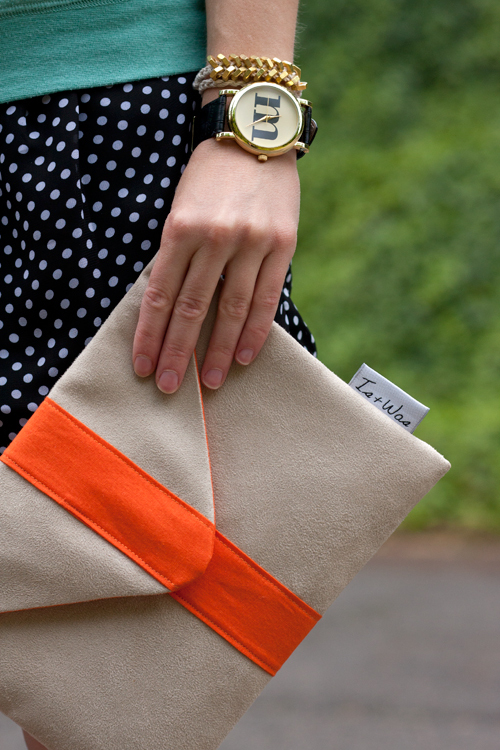 Exciting thing two: that racer-stripe clutch is one of the many colorful beauties piling up in my sewing room, just waiting to go live in the Is + Was shop. And see the tag on the side? I can't begin to tell you how happy that little piece of woven damask makes me; suffice it to say, the shop is really close to opening, and I can't wait to share it with you! This is the kind of tomfoolery that takes place when I think Michael is only taking pictures of my lower half. Tricksy devil. The world's tiniest functional bicycle. I love all of Gap's Fall outfits. You will never, ever believe that these drawings were done with Bic pens. Joanna's grammar post cracked me up. Good to know I'm not the only nerd. Thanks for joining me for the petite shopping guide. I hope you enjoyed it! If you didn't catch it, here are parts 1, 2, 3, 4, 5, and 6. Do you have other favorite petite resources that I missed? Or do you make your own clothes? I'm always on the lookout for new ideas, so I'd love to hear yours. P.S. Have you ever checked out Extra Petite? I just discovered it a few weeks ago, and it's absolutely lovely. 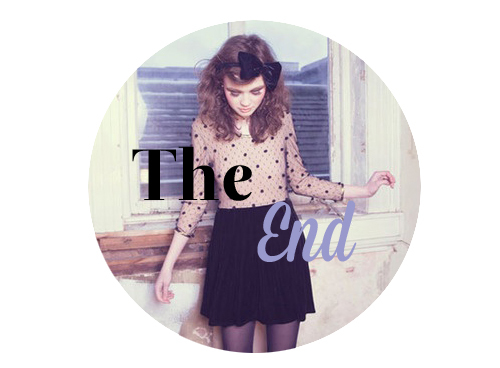 Go take a look if you're in the mood for more petite fashion. 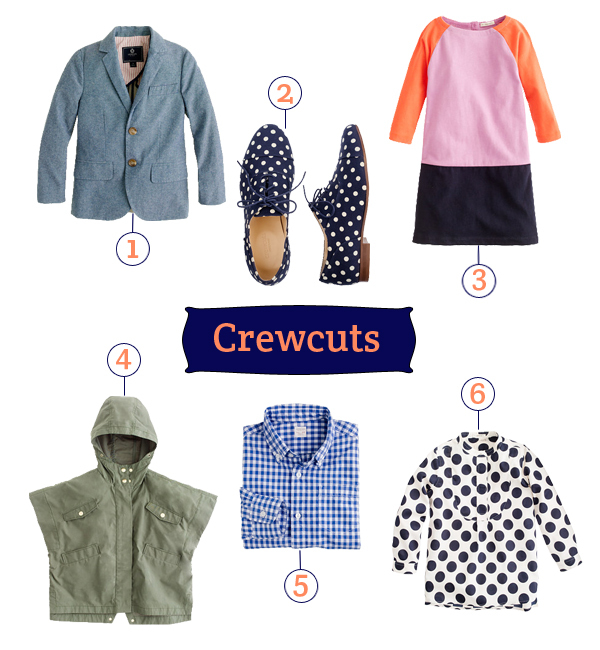 Crewcuts is a goldmine for petite J.Crew lovers. Truth be told, I haven't explored the J.Crew petites line very much because they frequently make miniature versions of their adult clothes in the Crewcuts line (as well as lots of great Crewcuts exclusives), and they're so much cheaper! Every time I hear someone exclaim over how cute this stuff is and lament that they don't make it in adult sizes, I do a little self-high-five and feel slightly mollified about how hard it is to find clothes that fit. Pants- think miniatures of the women's, like these pixie pants. Skirts- I'm in love with this Moon-Dot one. I promise I won't wear it with the Moon-Dot Tunic. Sweaters- especially classic fisherman and other knit styles that start appearing in the boys section in the Fall. Bonus: Shipping is always free on Crewcuts orders. Hooray for being small! Jeans! Delia's is a veritable treasure trove of colored skinnies. With sizes ranging from 00 to 19/20 (and inseams from 28" to 36"), and a slew of style and fit options, there's something for everyone, including non-petites (is it okay if I just call you daikinis?). Also, jeans are always buy one get one 50% off- great for stocking up on colors. Swimwear. 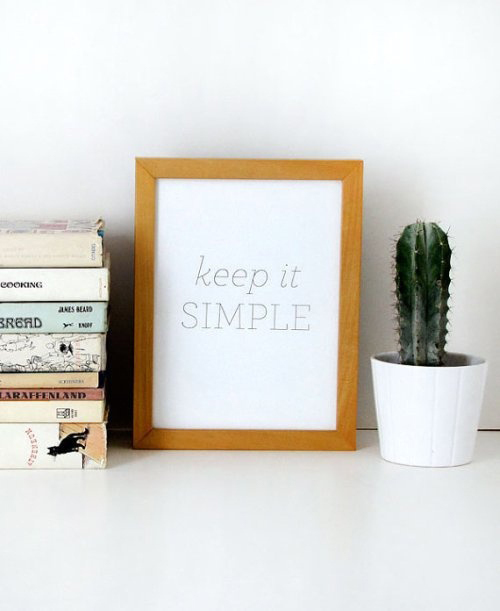 Lots of cute retro-inspired styles and prints, as well as solid color and one piece options. Dresses- I'm tempted to grab both of the striped versions above for some last-minute summer beach frolicking. Bonus: Frequent sales and deals, including site-wide discounts, and free shipping on orders over a certain amount (often as low as $25). You can always see current coupon codes here. A great sneaker roundup. Hooray for practical (and adorable) footwear! These apricot amaretti cookies sound delicious. A bedtime calculator- you tell it what time you have to get up, and it gives you a list of the best times to go to sleep, based on sleep cycle length. 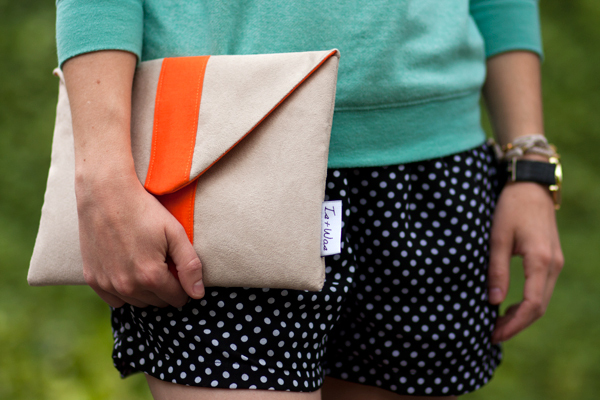 Love Liz's Neon Dots Tote Tutorial. This outfit has me feeling slightly friendly toward Fall. 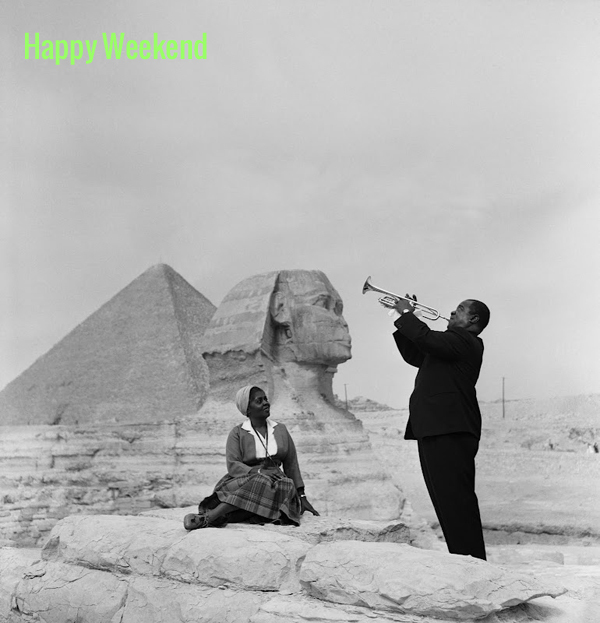 Hope your weekend is lovely and relaxing. The Nordstrom Juniors department is my go-to for just about everything. * The prices are excellent, the styles are adorable, and the vast majority are perfectly appropriate for 20/30-somethings. I'd love to pair this gorgeous colorblock blouse with some pixie pants, cap toe flats (or maybe some black brogues to give it a tomboy twist), and a cute topknot for work. Pants/Jeans/Shorts- I tend not to buy a lot of kids pants because they never quite fit right (we may be little kid sized, but we're not little kid shaped!). Juniors pants are the perfect compromise- small in all the right ways, but with enough room for some curves. Dresses/Skirts- Wouldn't this LBD be perfect for a night out? I love this peach one too...a little more demure, and just the right amount of flirty. 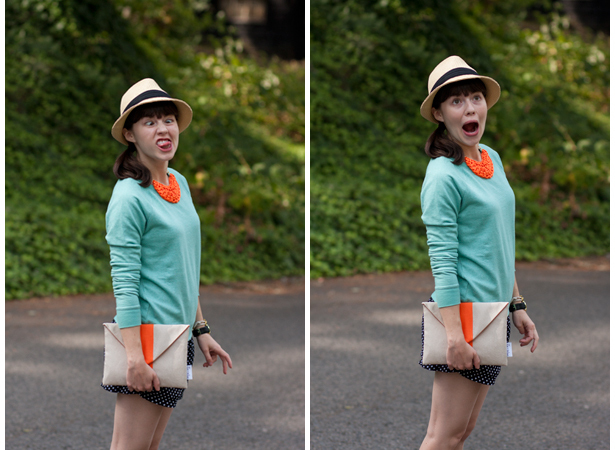 And this colorblock shift- how would I ever choose between peach and mint? Perfection. Button-downs/Blouses- I have the chambray one pictured above, and I plan to live in it this Fall. Bonus: Free shipping and free returns on everything. Also, they seem to be perfectly happy to take things back in any condition (I once took back a pair of youth Toms that I had worn for weeks, that hadn't stretched out the way I expected and were too small. They happily let me exchange them for a brand new pair- I even chose a different color!). Oh, and don't forget to check the kids department for shoes- they've got some winners. *Except shoes- weirdly the juniors shoes only go to a size 5 or 6, while the women's shoes frequently go down to a 4. Say what? When I was younger, I thought of Loft/Ann Taylor as a total "mom" store, but their style has changed so much in the last few years, and they've become a fantastic petite resource! They even carry petite sizes in stores (which is pretty uncommon in my experience), though the collection is much more extensive online. For many items, sizing extends all the way down to XXSp/00p- which, for me, means I can buy blazers and more "grown up" pieces without having to alter them. Cute blouses that can be dressed up with a skirt and heels for date night, or dressed down with jeans and flats for a weekend brunch. 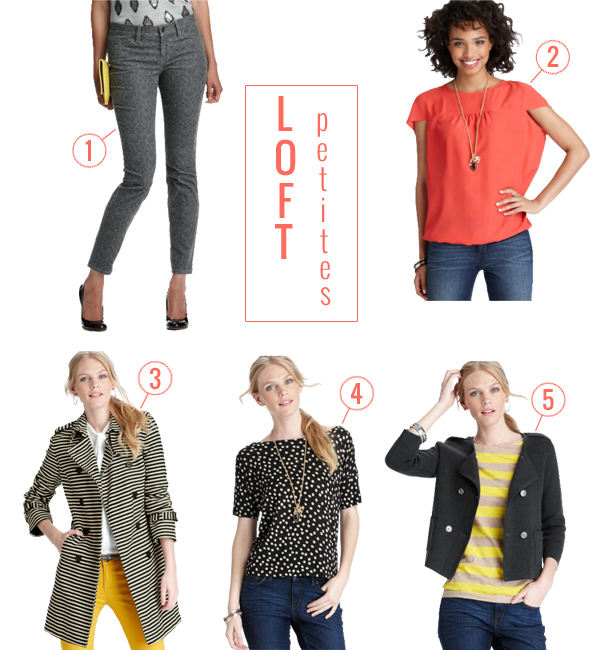 Bonus: Loft has frequent and fantastic sales, both in stores and online. They will often do 30% (or more!) site/store wide sales, or an additional 40 or 50% off of sale items. P.S. If your feet are a size 5 or above, don't forget to check out the shoes. I love these wedge booties. The Zara kids line is one of the newest additions to my shopping arsenal, and one of my favorites! I'd love to pair those studded flats with some Audrey-esque black pants, a comfy chambray top, and a leather messenger bag this Fall. Shoes- lots of adorable flats, boots, and sandals that are on-trend and grown-up looking. Bonus: they're virtually all under $50 and many are under $30! Coats- classic trenches, blazers, and waxed cotton jackets are a few of my favorites. Dresses and skirts- these can be a bit hit-and-miss, but frequently there are some real gems mixed in with the more juvenile looking items. Bonus: Free shipping and free returns on everything, so have no fear in ordering just to try on. Also, the majority of the kids shoes go up to a 5, which is the equivalent of a woman's 6 or 7, so even the less tiny-footed among us can benefit! I'm so excited to share this series with you! As I have alluded in the past, I'm extremely small. I stand just under five feet tall (4 feet, 11 and a half inches, if we're being exact), weigh in at 90 pounds, and wear a women's size 4.5 shoe- or, more often, a kid's 2.5 or 3. As you might imagine, finding clothing that fits me, much less fashionable and adult-looking clothing, presents a pretty serious challenge. Fortunately, it's a challenge I enjoy! Figuring out how to build a grown-up wardrobe from a mish-mash of kids and juniors clothes, petite pieces, and homemade items has become something of a science and a hobby for me, and this week I'll be sharing a guide to all my favorite petite shopping resources. Check back later today for the first post. Happy hunting, all you tiny ladies! In the interest of full disclosure, please note that I am not being compensated in any way by the stores I'm featuring. These posts are based purely on my own opinion and personal experiences. 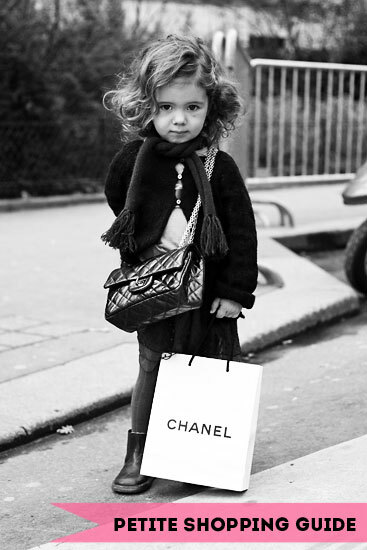 Update: You can see the whole petite shopping guide here: 1, 2, 3, 4, 5, and the wrap-up. Hope you enjoyed it!